This 130sqm apartment, sitting on the 4th floor, is newer and slightly more modern than those on the other floors. Yet what it lacks in old-fashioned stucco decoration and herringbone parquet flooring, it more than makes up for in clean lines and a classic design aesthetic… and all before you even consider the layout. However, the floorplan is certainly no afterthought. 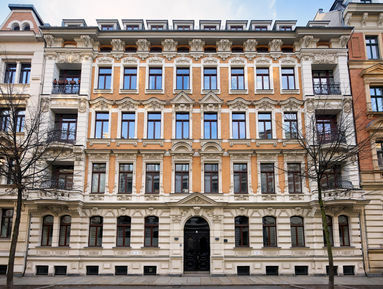 Three of the rooms, all wonderfully spacious, face onto the quiet, residential Gustav-Adolf-Strasse. On the other side of the hallway, another room and the kitchen share a spacious balcony, looking out into the pretty, green back garden. Beyond this are a master bathroom and separate guest bathroom, both of which are immaculately equipped. The apartment’s location on the top floor of the building also means that it is bathed in light.